Do US Corporations Know How to Function Without Their Q.E. Fed Nanny? It’s no wonder that M2 money supply, the liquidity that makes up checking and savings, money market accounts, and mutual fund holdings, has suddenly fallen of a cliff now that QE endless summer has ended. It’s a novel idea, 10 years into ZIRP and QE, that a viable economy is supposed to be self-sustaining and that companies unable to succeed of their own merit and accord should go bankrupt. There has been a lot of talk about trade wars in recent weeks. But the biggest risk to the American stock market remains monetary tightening. The monetary tightening dynamic can be best seen in the ongoing slowdown in the growth rate in the M2 money supply. 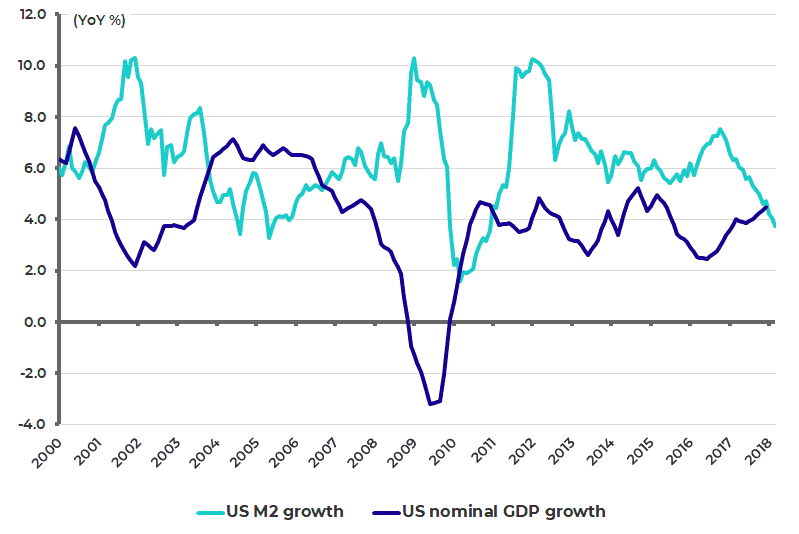 US M2 growth slowed from 7.5% YoY in October 2016 to 3.7% YoY in March 2018, compared with nominal GDP growth of 4.5% YoY in 4Q17. This is the first time M2 growth has been running below nominal GDP growth since 2011. This downward pressure will continue with a US$60 billion reduction in the Fed balance sheet anticipated in the first quarter of this year, US$90 billion in the second quarter and a further US$270 billion reduction in the second half of this year, as a result of the policy known as quantitative tightening. The result, if balance sheet contraction really does proceed in this manner, should be a continuing slowdown in M2 growth. This would result in a deceleration in nominal GDP growth if velocity remains stable.